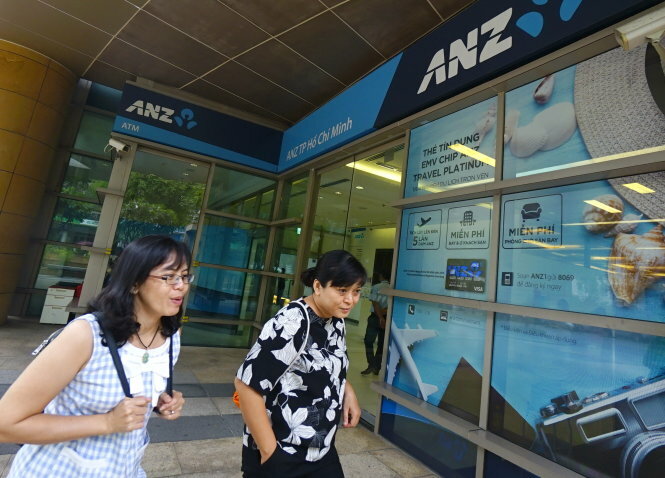 People walk past the ANZ branch in Ho Chi Minh City. Several foreign banks have exited Vietnam or narrowed operations in the Southeast Asian country, against early expectations that they would soon eat into the market shares of local lenders. The upcoming sale of the Ho Chi Minh City branch of the Commonwealth Bank of Australia (CBA) to local lender VIB, as announced earlier this week, is only the latest evidence that foreign credit institutions are setting up strategies to pull out of Vietnam. CBA first entered Vietnam in 1994 with a representative office in Hanoi and only opened its Ho Chi Minh City branch in 2008. Analysts believe that the sale of CBA’s Ho Chi Minh City operations to VIB is an indicator that the company is planning a complete exit from the Southeast Asian country. In March 2016, British bank Standard Chartered removed its representative from the board of directors of ACB and signaled plans to withdraw its 15 percent stake from the Vietnamese lender. In April this year, ANZ reached an agreement to sell its Vietnamese retail business to Shinhan Bank Vietnam in a move aimed at pivoting toward institutional banking in the country. VIB also showed interest in acquiring ANZ but was ultimately outbid. Two months later, HSBC announced it would sell its entire 19.41 percent holding in local lender Techcombank. The Vietnamese bank is seeking shareholders’ approval to purchase these shares for VND4 trillion (US$176.21 million). While it had previously been expected that foreign banks would pose tough competition for local lenders, these four significant moves in less than two years are signaling otherwise. Insiders are pointing to several reasons to explain the exit trend of foreign banks in Vietnam, including inadequate knowledge of the local business environment and a higher level of expected legal compliance. “While they have better technology and stronger financial muscles, foreign banks cannot operate just as their Vietnamese counterparts as they must follow some specific regulations for international credit institutions,” the director of retail of a Ho Chi Minh City-based bank explained. The banker added that foreign banks have paid little attention to expanding their ATM or POS networks, making it difficult to broaden their retail operations. Whether it boils down to inability or unwillingness, the situation is causing foreign banks to either sell their retail business to local banks to focus on institutional banking, as was the case of ANZ, or completely pull out like CBA, according to the banker. Banking expert Nguyen Tri Hieu said foreign banks take local laws and the rules for risk management more seriously than their Vietnamese counterparts, which is a major factor in their inability to compete. “Foreign banks also have a poorer understanding of the local markets and customers than Vietnamese lenders,” Hieu said. Hieu said the total assets of foreign banks in Vietnam currently make up only ten percent of the Vietnamese banking sector. “This has hindered the expansion of foreign banks, especially at a time when competition is tough and operation costs keep rising,” he elaborated. However, Nguyen Dinh Tung, CEO of local lender OCB, believes that the recent developments do not send enough signals that foreign banks are on trend to leave Vietnam. “Global banks have their own business strategies and it is normal for them to leave a market where their operations are worse than expected or the local competition is too fierce,” Tung said.